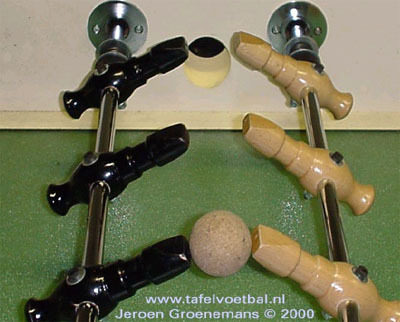 Recently, I received an email from Bart van Winden who has a friend, Jeroen Groenemans, that maintains a foosball site in Netherlands. He was going to add foosball.info to his web site "Links" sections and was wondering which country the foosball.info site should be categorised under. Before I replied him, I visited the site at http://www.tafelvoetbal.nl. To my surprise (or rather my ignorance... :-), the flash intro showed me a foosball table which I cannot recognise. Since the site was in Dutch, I had no idea what the words meant. I tried clicking on something familar, like "Foto's", which lead me to a photo listing dating from 1999. You have to check it out yourself... LOL. Also, you guys MUST check out the "Movie" link below and get a first hand view of the "Euro Pin" at work!!! "In the Netherlands the most popular table is the Topper2000. It is made in the Netherlands and looks a little bit childish with his wooden man and cork balls, but they already play on this table for more then forty years. In our country there is an organization that runs a competition with this table that counts 1000 players. The game on this table is on a very high level and the game is played the same (Euro-Pin) as on the Belgium (our neighbors) Jupiter tables, the table on which Frederico starts his career. But I think the Topper2000 has not a big future because you only see them in our country and there is no way to compete to the rest of the world. I personally prefer the Tornado. It is not easy to promote the Tornado in our country because all the Pro’s who has play for more then twenty years on the Topper2000 have to practice a lot again to become on the same level as they have on the Topper2000. 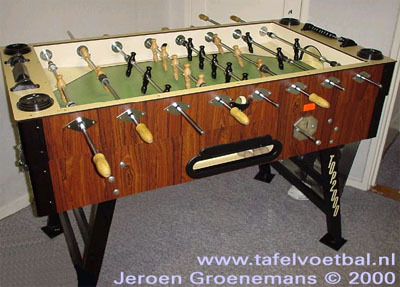 An other table, which is popular in the Netherlands, is the Leonhart. This table is made in Germany where it’s very popular. It looks and plays like the old Tournament Soccer. In the Netherlands there are about 200 Leonhart Player. There are only about 50 Tornado players in our country. 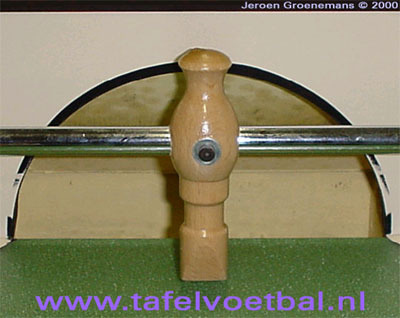 You can take pictures from http://www.tafelvoetbal.nl/topper.htm when you tell where you got them from. For question you can always ask me! The following are just some of the pictures I took from the site. There are plenty more, please refer to the related links sections below. Perspective shot of the Topper 2000 foosball table. Shot of the goalie. Notice the shape of the goal behind the goalie.